Posted for: Susan Ottignon, Special Collections. When I catalog each digital issue of any newspaper, and in this case, the April 10, 1860 digital issue of the National Defender, for the Digital Library, I browse the issue for noteworthy subjects to highlight, or in other words, I assigned subject headings to assist a future researcher in locating the subject. The newspaper’s column, “Personal and Political,” found on page 2, in this issue, caught my eye; I recognized the names Charles Francis Adams and General Jefferson Davis. The remainder of the column’s news impressed me with the wide range of news to report; the reports presented both serious and humorous news to the reader. The selection conveys what was considered current national news, by the publisher, as well as, I believe, the annotations provide anecdotal information about the news. The below annotated and transcribed text is from the digitized copy in the Montgomery Historical Society of Montgomery County Collection. National Defender, v. IV, no. 36, Tuesday, April 10, 1860, Whole Number: 192, p. .
— The Hon. Charles Francis Adams  and the Hon. Josiah Quincy,  son, are the largest tax payers in Quincy, Mass. The former pays $1,440, and the latter $485. As trustee, Mr. Adams pays $150 additional to the above named sum. 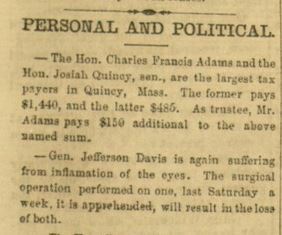 — Gen. Jefferson Davis  is again suffering from inflamation [sic] of the eyes. The surgical operation performed on one, last Saturday a week. It is apprehended, will result in the loss of both. — The Hon. George N. Briggs  of Massachusetts, has been cordially and unanimously elected Chancellor of Madison University. If he accepts the appointment, Dr. Eaton  will retire from the Presidency, that he may devote his whole time to the more congenial duties of his Theological Professorship. — Mr. J. H. Brown,  who supports fifty-two young Baptist theological students at Howard College,  in Alabama, at an annual cost of $13.000, has recently endowed a theological chair in that college by a contribution of $25,000. — The widow of the late Rev. Robert Hall,  died at her residence near Bristol, England, on the 15th ult.,  at the advanced age of 74. — Something out to be done to prevent people from giving vent to their grief in verse when they are bereaved. What fate too hard for the man who appended the following lines to the announcement of a young lady’s death in a neighboring city? — On Tuesday night, in Albany, Mr. John Niblock was bitten on the cheek by a man named Meegan, who threw him down and for several minutes gnawed his face. It is feared that mortification or erysipelas will set in. — The town of Dutch Acera is fixed upon the birth place of a monster. The being is said to have been all covered with hair, to have had six fingers on each hand, and six toes on each foot. It had three heads and a tail, eyes at the back of each head, and three pairs of horns. The account adds that the child was, according to custom, buried alive, and that the mother died eight days afterward. — Miss Effie Carstang,  of St. Louis, who some months ago recovered a verdict of $100,000 against Mr. Shaw for alleged breach of promise, has had a second trial and comes out minus the hundred thousand dollars, and has a round bill of cost to pay. We fear that Effie’s reputation suffered by the investigations. — In one of the towns of Connecticut, on the line of the New Haven Railroad, the Republicans took charge of a town pauper, from Friday, paying his board, expenses, &c. They felt so sure of his vote that they gave themselves no further trouble about the vote till Monday, when the voter turned up missing. Upon inquiring in to the absence, they found the pauper in bed ; some of the Democrats had stolen his pantaloons and the vote was lost! On both sides there were many such tricks practiced. “COL John Quincy Adams, II” Find A Grave. 9 Feb. 2017. “. Quincy is the birthplace of the second and sixth U.S. Presidents, John Adams and his son, John Quincy Adams …” City of Quincy: About Quincy. Quincy, MA 02169. 9 Feb. 2017. “1841 Incorporation. The Alabama Baptist State Convention established a college for men, naming it Howard College in honor of John Howard, an 18th-century English social reformer. ” “History of Samford University. ” Samford University. 11 Feb. 2017. ; Garrett, Mitchell B. “Sixty Years of Howard College, 1842 – 1902.” Howard College Bulletin, 85(4), October, 1927, p. 69. Internet Archives. 11 Feb. 2017. <https://archive.org/stream/sixtyyearsofhowa00garr#page/22/mode/2up/search/%22howard+college%22>; For more information on the residents in Marion, Alabama, specifically at Howard College, see: “1850 Federal Census Perry County, Alabama (Transcriber’s Notes).” Comp. by J. Hugh LeBaron. 2001. The USGenWeb Archives: Perry County, Alabama. Copyright © 1997 – 2017 The USGenWeb Archives Project. 11 Feb 2017. “Hall proposed marriage on a later visit, having never spoken to this woman before. He was forty-­three years old and possessed an incomparable mind, while she was a servant girl and completely . . . The woman’s name was Elizabeth Smith . . . marriage on March 25, 1808 …” McNutt, Cody Heath. “The Ministry of Robert Hall, Jr.: The Preacher as Theological Exemplar and Cultural Celebrity.” p 49. Dissertation, The Southern Baptist Theological Seminary, 2012. 10 Feb. 2017.